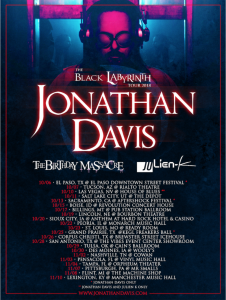 Singer, songwriter, composer, producer, multi-instrumentalist, Korn frontman and one of the most inimitable voices in music, Jonathan Davis is set to hit the road for his ‘The Black Labyrinth Tour’ this Saturday (10/6). “No matter how hard you try to fight bad things in your life, life will be what it is. It’s up to you to accept that, combat it, and move forward, or it’s up to you to be in denial. Then, it becomes a thorn in your side until you finally deal with it. This is it. Just deal with it.”The music of ‘Black Labyrinth’ represents a natural step for Jonathan. A true original, the overpowering figure he casts behind that H.R. Giger-made microphone remains just as iconic as his signature scream does. His output in Korn encompasses two GRAMMY® Award wins, worldwide sales of 40 million-plus, and countless sold out shows in nearly every corner of the globe. Throughout over 20 years in music, his presence coursed through film scores to popular video game franchises, and official remixes for the likes of Steve Aoki and more. 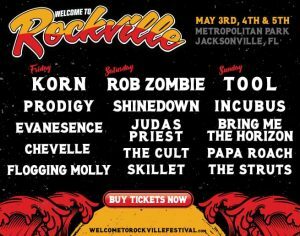 Along the way, he lent his voice to tracks for everyone from Linkin Park to Tech N9ne.Jonathan Davis is one of rock’s most iconic and prevalent frontmen and one of modern music’s true geniuses. The Black Labyrinth Tour provides fans the opportunity to watch him bring these complex, thrilling and emotive tracks to life. You definitely don’t want to miss this one.